Milt Chortkoff of Milt & Edie’s Drycleaners & Tailoring Center in Burbank, California, passed away at age 88 on December 28 surrounded by his family. Chortkoff was a prominent drycleaner who started out in cleaning at his family business Hollyway Laundry & Dry Cleaners at 10, “delivering wet washes in a pushcart around Brooklyn” he told Cleaner and Launderer in 2016 on the occasion of his 70th anniversary in the industry. He also delivered clothes to pay his way through college at 17 in 1946. in 1988 he came out of retirement to purchase a drycleaning facility in Burbank, naming it Milt & Edie’s Drycleaning & Tailoring Center. Milt & Edie’s is always open as a 24/7/365 business. Milt & Edie’s has 90 employees at present. Chortkoff was scheduled to receive DLI’s Diamond Achievement Award, the Institute’s highest honor, at the California Cleaners Association trade show this year. The award will be presented in his honor to a member of his family in August. The Milt & Edie’s customer experience is legendary in the drycleaning industry. From the bright magenta storefront, to the complimentary fresh popcorn, refreshments, and maitre d’ to direct customers to the next available customer service representative. The true test is the quality of the garments which are backed by a customer service pledge to make them perfect every time. Chortkoff is survived by his wife Edythe, brother Burt, children Beth and Ben and five grandsons. 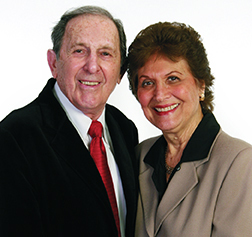 Contributions in Chortkoff’s honor may be made to the City of Hope national medical center.